Price is $99, not including shipping and handling. All orders ship from Ithaca, NY via Priority Mail. Please contact us prior to ordering for international orders or to make other shipping arrangements. At the moment, we build in small batches and handle all online ordering through Reverb. If you’re interested in picking up one of these boxes, we invite you to visit our shops – if it’s there, it’s available. If not, either give us a few days or drop us a line. First example of the VauxFlores Gold Standard Fuzz on viola, as played by Liz Meredith, a composer, performer and designer responsible for the pedal’s artwork. Second example of the VauxFlores Gold Standard fuzz featuring Travis Johns on bass. Travis designed the circuitry for this thing. He’s also a visual artist whose pieces usually make sound. Or maybe it’s the other way around and he’s a sound artist whose pieces tend to have a visual component. What day is it today? 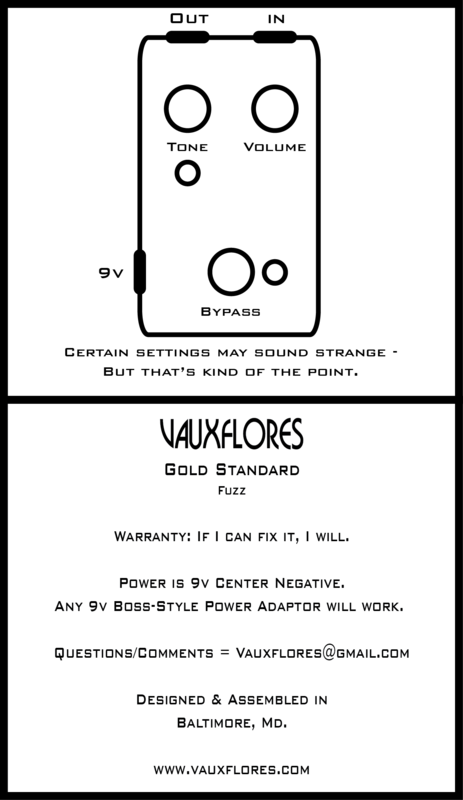 A quick third example of the VauxFlores Gold Standard fuzz featuring Travis Johns on guitar. Travis designed the circuitry for this thing. Ala settings volume is at 60% (what can I say, there’s neighbors and it’s late) and tone is set to around 9 PM. Amp was a ZT Lunchbox. Guitar was a Telecaster. Example 4. I believe we call this jamming. For all that are curious, the status LED for the Gold Standard is white.